We chat with Infliction's creator about horror, family life, and what's next for this indie developer. 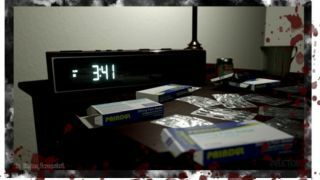 I spoke to Clinton McCleary last year when his indie title Infliction was starting to get some media traction, and with the game entering a new, final phase of development, we were happy to sit down again, and catch up with Clinton on how the game's progressed, and how it's become a much more... personal project. PCG: It's been a while since we last spoke, so I guess the first question is… How’s the game progressed since August? And is it still a solo project? Clinton: I really enjoyed doing that interview. A lot has changed since August last year. I decided to expand the scope of the game which is easier to do when you’re working alone. The game was originally set in one constantly changing location. Now there are several locations tying into the games narrative. I’ve also beefed up the way the player engages with the AI. I’ve given the player a few options in an otherwise helpless situation. Infliction is still a solo project and is about 95% complete at this time. I’m definitely in the polish phase now. You’ve recently launched a kickstarter to get the final few touches on the game – what’s that process been like? It’s been awesome, and really full on! I’ve got Lumi consulting helping me out with the marketing side of the project and they’re doing an amazing job. There are so many facets to making a Kickstarter. First I created a demo especially for the Kickstarter campaign. Then came videos, trailers, graphical assets etc. Lumi has been guiding me every step of the way and it’s been a really exciting and insightful experience. Now let’s talk process – I understand one of the drivers of the game was based around your own fears around your own family. How has that informed Infliction? The very first prototype that would one day become Infliction was just an empty house with Gone Home-like gameplay and a very basic AI character walking around in it. I had some general plot points laid out in my head, but it wasn’t until I started to write dialog for the characters and started plotting out the horrific events that shaped their personalities that I realised I actually had something to say. The primary inspiration for Infliction's story came from asking myself a simple question: what could possibly happen in my life at that time that would tear me and my family apart? I'd gotten married, we'd just had a baby, and suddenly I was discovering that I had a whole bunch of new fears. Things like accidents and sudden illnesses, things with the potential to break up my family, were suddenly more frightening to me than any of the stuff that scared me before. Once I realised how much this scared me, I thought about the kind of inner demons that drive real people to do unspeakable things to the people closest to them, and then about how those "demons" could be manifested in a video game. The design of Infliction then started to focus on letting players take a walk through a really damaged mind, and get right up close to the warped thought processes and chain reactions of bad decisions that they finally externalise in terrible actions. Sure, I want to scare the pants off people, but I want it to also have serious emotional weight, not just empty scares. When I'm testing the game and I hear and read about my deepest fears playing out on a digital stage, it both moves me and sends a chill down my spine. If I can bring this unease to players, make them feel the same kind of deep fear, then I reckon I've done my job right. This is sounding like a really personal project, and one that seems to touch on mental health issues as well. How much research have you done into that area? It is a very personal project, the only specific type of mental illness I reference is depression. I have researched the subject thoroughly though I’m also drawing from my own experiences. But this is only one element that helps to shape these characters. Other elements affecting the characters in this game are also things like alcoholism, addiction, anxiety etc. It’s not so much about direct correlation with any particular mental illness but rather plays with the idea that in human history, we haven’t always dealt with mental illness correctly. In the past some may have even thought mental illness was a form of possession or influence from an external force. As we’ve become more advanced we’ve explained away the supernatural with science. Infliction toys with the idea of a kind of circular logic. If a demon whispers in your ear, does this make your mind unstable? If your mind is unstable, did the demon ever exist at all? A kind of chicken and egg thing. I wanted to avoid any specific labels directly linking anything going on to any specific disorder. I had also received feedback early on in regards to how this story would approach mental health which has lead me to wanting the sense of ambiguity and confusion transferred on to the player as much as it is on the characters in the world. And, finally, with the game so close to being done, are you starting to look at life beyond Infliction? Is there another idea in the pipeline? Several. There is one idea I had before I started Infliction but the scope was too large for a solo developer. It was a physics-based puzzle boss-fighting game with a horror theme. I’d like to revisit that but I try to keep the ideas at bay until Infliction is finished. I’d also like to experiment with VR so there is a potential project there. It’s been a long road and it’s entirely likely Infliction will be my central focus for at least 12 months post launch with updates and - hopefully - ports. If Infliction is sounding like your sort of game, or you just want to support an Australian indie developer, you can back it on Kickstarter here.